Almond Joy Cake – chocolate almond cake layers with a coconut buttercream, toasted coconut and almond filling and chocolate ganache. I’m so excited about this cake! But, I have to preface it by saying I’m actually not a huge fan of the candy bar, Almond Joy. It’s the coconut. I’ve never been a fan of raw coconut. Toasted coconut, on the other hand, is a whole different story. I can eat it by the handfuls! So, when a few of my friends requested I come up with an Almond Joy cake, I was hesitant at first. I just wasn’t excited about a raw coconut filling, like the candy bar. But lucky for us, my girlfriends were persistent and I eventually decided to add it to my list of cakes to make. 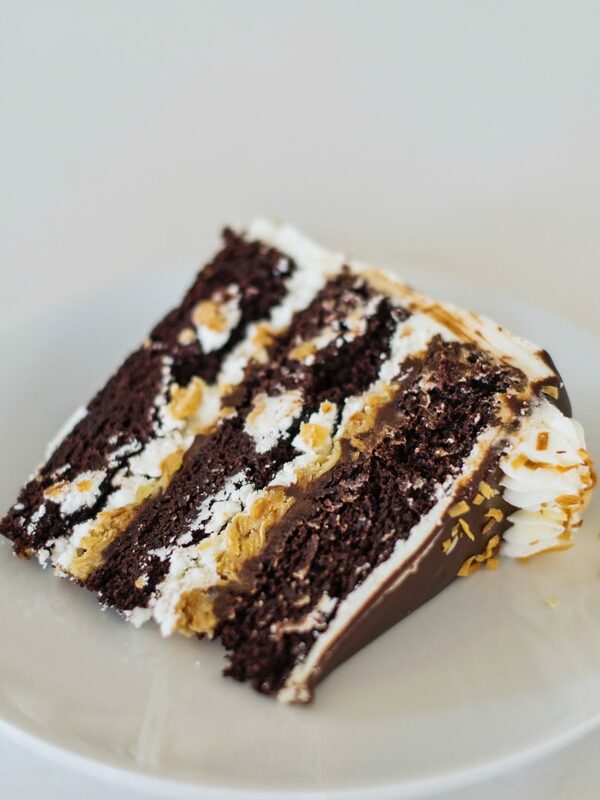 As I thought about how I would put my own spin on this candy bar inspired cake, I knew I couldn’t use raw coconut. It had to be toasted coconut – which made me think of the coconut crack filling in my German Chocolate Cake, inspired by Milk Bar. Like this one, my German Chocolate Cake uses toasted coconut in the filling instead of raw coconut. I also decided to add some toasted almonds to the filling to give it some more texture and resemblance of an Almond Joy. 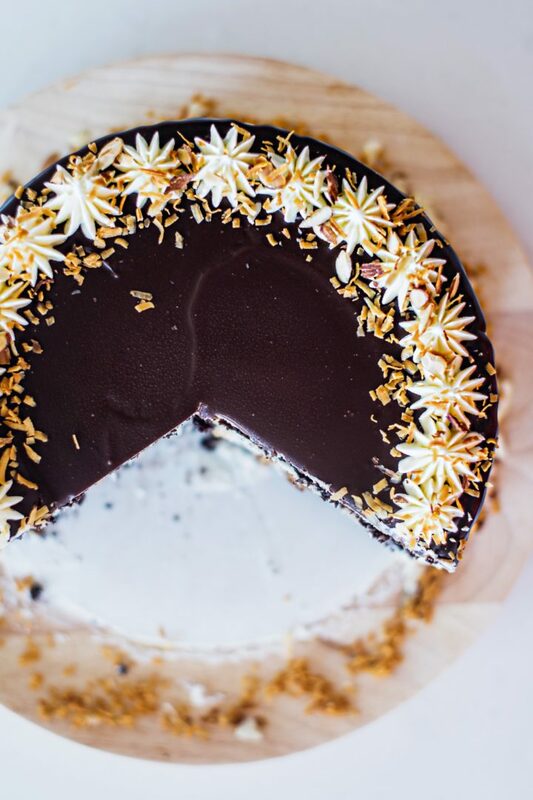 For the cake layers, you’ll see I use my go-to chocolate cake recipe and add a little almond extract. Feel free to add more extract if you like a stronger almond flavor. I use only two teaspoons for a subtle flavor, but I know some of you love almond extract and may want more. Make sure to taste test the batter along the way! And instead of coating the cake in chocolate like the candy bar, I decided to use my coconut buttercream from my Coconut Key Lime Pie Cake. This frosting is out of this world! It’s so creamy and smooth, and the flavor is perfection. To finish up the cake, I wanted to add a bit more chocolate in the cake. 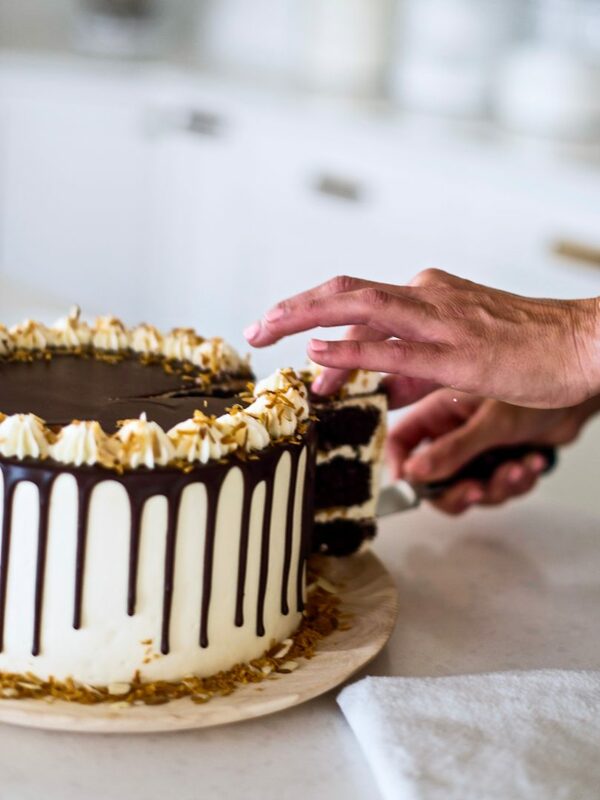 Within each layer, you’ll have some chocolate ganache, as well as a chocolate drip on top. 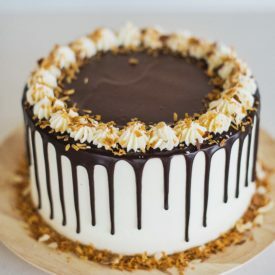 I really like the balance of the not-so-sweet dark chocolate cake and ganache with the sweet and salty coconut almond filling and coconut buttercream. I took one bite of this cake and about died! Honestly, I surprised myself with how much I like this coconut filled cake. Every bite is a little piece of heaven, if you ask me. Here’s a quick stacking tutorial, with a fun little appearance by miss Avery. And, as always, instructions for assembly are in the recipe below. 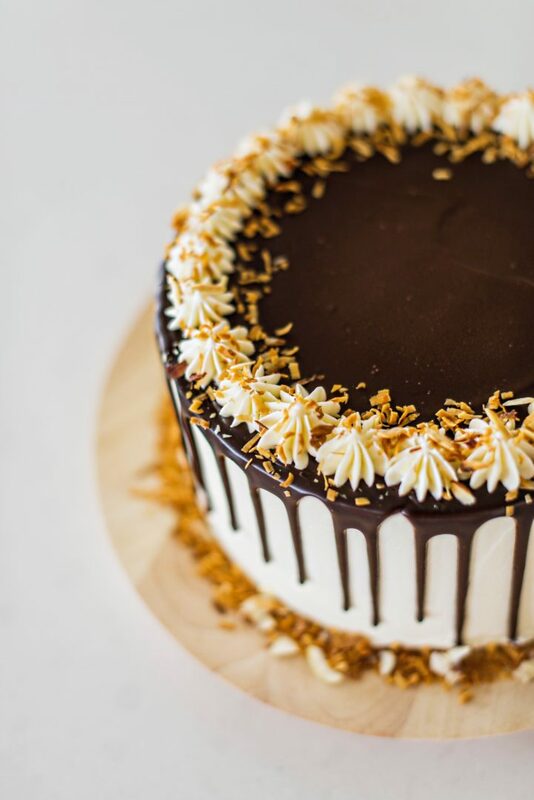 Rich chocolate almond cake layers with a coconut buttercream, toasted coconut and almond filling and chocolate ganache. Preheat the oven to 350 degrees F. Prepare three 8” round cake pans by spraying each with nonstick spraying, lining the bottom with parchment and spraying again. Set aside. Combine eggs, buttermilk, water, oil and almond extract in a measuring cup and lightly beat with a fork. Add wet ingredients to the dry ingredients, and mix on low speed until the dry ingredients are incorporated. Batter will be thin. Scrape sides and mix for another 30 seconds. Divide batter evenly among prepared pans (I like to use a kitchen scale to ensure the batter is evenly distributed - you'll get about 15 to 16 ounces of batter in each of the 8-inch pans). Bake for 17 to 20 minutes (you may need more time depending on your oven), until toothpick comes out with just a few moist crumbs on it. Cool on wire racks for 10-15 minutes, then gently invert onto racks until cooled completely. When cakes are completely cooled, level them if needed. I like to wrap each cake layer individually with plastic wrap and stick it in the freezer until I’m ready to frost. The cake will be easier to work with if it’s cooled a bit. With the mixer on low speed, gradually add the sifted powdered sugar, followed by the emulsion and salt. Preheat your oven to 325 degrees F. Spray the bottom and sides of a 9x13" with with nonstick spray. Set aside. In the bowl of a stand mixer fitted with the paddle attachment, combine the sugar, brown sugar, milk powder, and salt. Mix on low speed until evenly blended. With the mixer on low speed, add the melted butter and stir for one minute until all the dry ingredients are wet. Add the heavy cream and vanilla and continue mixing on low speed for about one minute, until any of the white streaks from the cream have completely blended into the mixture. Scrape down the sides of the bowl with a spatula. With the mixer on low speed, add the egg yolks, stirring them into the mixture until combined. Be careful not to over beat (aerate) the mixture, but certain the mixture is glossy and homogenous. Pour the filling into the prepared pan and bake for 10 to 15 minutes. You want the filling to be firmer and more set toward the outer edges of the baking pan but slightly jiggly and loose in the center. If the filling is still jiggly all over, give it another 2 to 3 minutes. Let the filling cool slightly and add the toasted coconut and toasted almonds. The filling can be used immediately or stored in an airtight container in the refrigerator. Heat the cream in a microwave safe bowl for about 1 minute. Pour the cream over the chocolate chips. Let sit for about 5 minutes. Stir until the chocolate is completely melted. Let cool slightly before using in the cake. Heat the remaining chocolate ganache for about 30 seconds. Add additional 1/4-1/2 cup heavy whipping cream to make the ganache thinner and easily pourable out of a drip bottle. On a cake board, spread a dollop of frosting to act as "glue" to the cake. Place the first cake layer, top side up, on the center of the cake board. You will have a little edge of the cake board showing around the cake. Spread about 3/4 cup of the coconut buttercream over the cake layer, followed by about 1 cup of the coconut and almond filling. 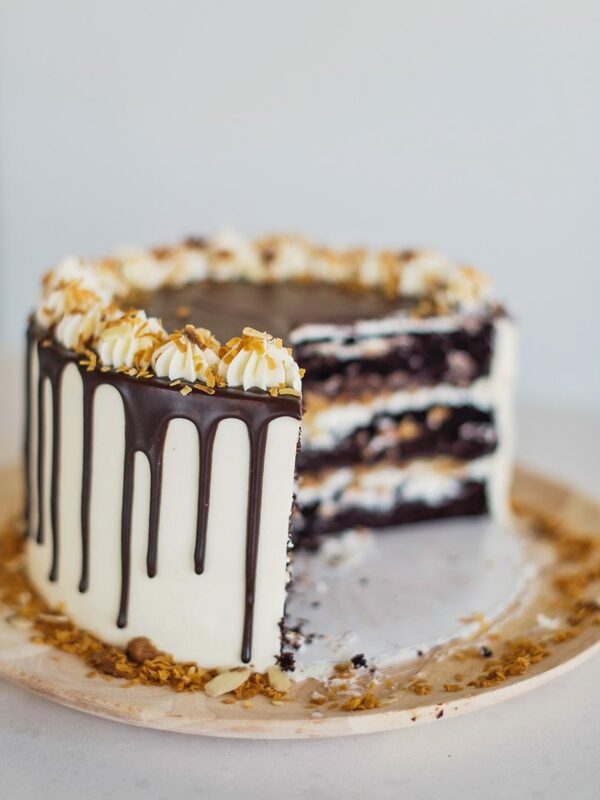 Drizzle with chocolate ganache. Place the final cake layer, top side down, on the second layer of fillings. Apply a thin coat of coconut buttercream around the entire cake to lock in the crumbs. Place the cake in your freezer for 10 to 15 minutes to set the frosting. Remove the cake from the freezer and continue to frost the cake with the remainder of the frosting. If you want to pipe swirls or any decorate design on the cake, I suggest adding another quarter or half recipe of the coconut buttercream. Use the chocolate drip recipe to "drip" the chocolate along the sides of the cake (as shown in the video above). so coconut cream is similar to whipping cream? like the texture ? what would be a good substitute? The coconut cream I like isn’t the canned one. It’s the kind you add to mixed drinks. I actually shared it on my insta stories today. The best sub would actually be heavy whipping cream. Hi, is the coconut almond filling like a crumble? Does it bake into a cookie-type bar & then you break it apart or what is the texture I’m going for and how do I use it? It is similar to a granola after baking? Also, where do you get coconut emulsion and what is it? I’m making this tomorrow with pecans instead of almonds and it looks SO good!! Can’t wait! Thanks so much! You actually bake the filling without the coconut and almonds first. It’s a gooey consistency after it bakes and then you stir in the almonds and coconuts. Coconut emulsion can be found at Michaels sometimes or some grocery stores have coconut extract. but I got mine at Orson Gygi and Amazon. Is milk powder the same as powdered milk? I don’t have coconut emulsion. Can I use extract? What is coconut emulsion, and where do you find it? It’s like an extract but it’s not made with alcohol and is a bit creamier in flavor. I got my coconut emulsion on Amazon, but if you can’t find it, you can use coconut extract. I made this cake for my husband’s birthday. It was delicious. I was pleasantly surprised to see there was still plenty of filling left for the cake even after I ate so much of it before using. Man! That stuff is delicious! However, I barely had enough ganache and frosting for this cake. I haven’t had that problem before with any of your recipes, but this time I ran out. I wasn’t able to do any kind of piping or decorating on top. I would make extra next time for sure. 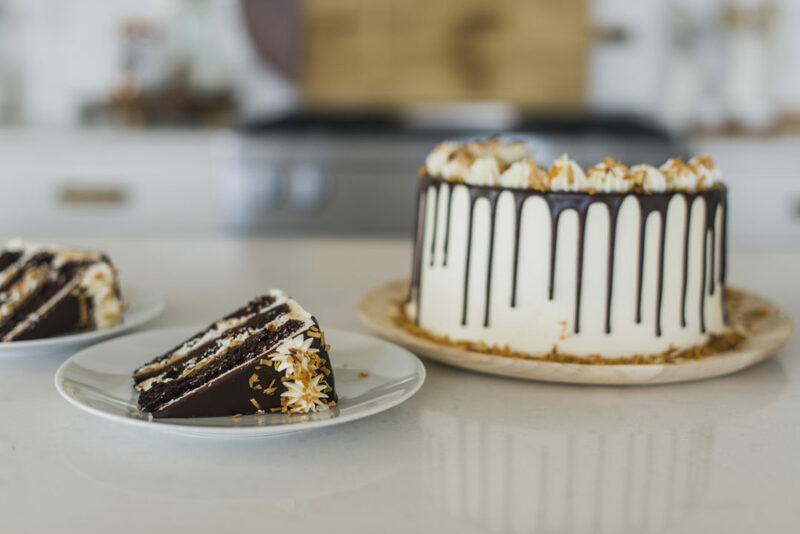 My recipes give you enough frosting for about 3/4 cup frosting between each layer and then enough to frost the outside of the cake – but if you want to pipe on the cake, you’ll have to add another 1/4 of the frosting recipe.